Roman emperor; born Feb. 27, 274; died May 22, 337; proclaimed emperor by the army in Gaul on the death of his father, Constantius Chlorus (306). He defeated Maxentius, his rival in Italy, in 312; and after routing Licinius, Emperor of the East (323), became sole ruler. In 330 he transferred his court to Byzantium, thenceforth called Constantinople; but died in the midst of his preparations for a Persian campaign, after receiving baptism from Eusebius, Bishop of Cæsarea. Being the first Christian emperor, the Church conferred upon him the title of "The Great." Political and religious considerations dictated Constantine's friendly attitude toward Christianity. As early as the war against Maxentius, his standard bore a Christian emblem; but previous to his victory over Licinius he contented himself with placing Christianity upon a footing of equality with heathendom. As sole ruler he did not go materially beyond the gradual repression of heathenism and the public encouragement of Christianity; he showed his attitude on this question especially by conducting the first ecumenical council at Nicæa (325). After his victory over Licinius, Constantine inaugurated a more and more hostile policy toward the Jews. It is true that as early as 321 a law was promulgated which made it obligatory for Jews to fill onerous, expensive municipal offices; while on the other hand such Jews as had devoted themselves to the service of their own religion were exempted in 330 from all public services, and those who were already "curiales" were freed from the levying of taxes. In 329, however, the Jews were forbidden to perform the rite of circumcision on slaves or to own Christian slaves; the death penalty was ordained for those who embraced the Jewish faith, as well as for Jews versed in the Law who aided them. On the other hand, Jewish converts to Christianity were protected against the fanaticism of their former coreligionists. Simultaneously with this an edict was issued forbidding marriages between Jews and Christians, and imposing the death penalty upon any Jew who should transgress this law. Some of these enactments were affirmed in 335. Noteworthy is the hostile language of several of these laws, in which Judaism is spoken of as an ignominious or as a bestial sect ("secta nefaria" or "feralis"). 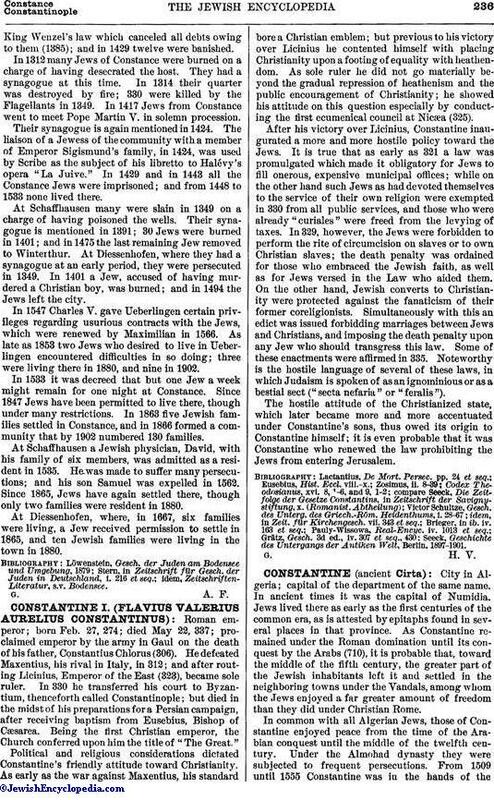 The hostile attitude of the Christianized state, which later became more and more accentuated under Constantine's sons, thus owed its origin to Constantine himself; it is even probable that it was Constantine who renewed the law prohibiting the Jews from entering Jerusalem. Seeck, Geschichte des Untergangs der Antiken Welt, Berlin, 1897-1901.